The onslaught of stubbornly grim doom from this summer’s movies aside, most of us are still open to enjoying the pleasures of a tall tale, well told. Many children in the United States grew up with elementary school primers or dentist offices that had the stories of Paul Bunyan and Babe the Blue Ox, John Henry vs. the steam engine, or Pecos Bill lassoing a tornado. They are sort of proto-superheroes that bridged the gap between myth and history. 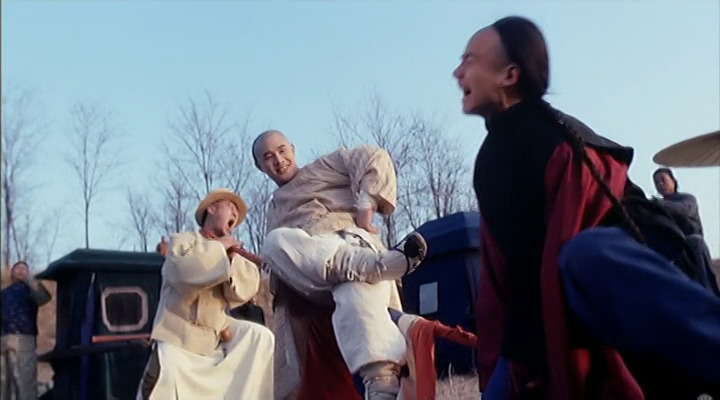 This installment of "Mark Ahn Knows Kung-fu (formerly "Kung Fu Corner") focuses on one of China’s many folk heroes, Fong Sai-yuk, depicted by Jet Li in his 1993 action-comedy of the same name. (The film was also released as The Legend, or The Legend of Fong Sai-yuk in its English incarnations.) It’s definitely a tall tale; we’ll work our way to “well-told.” For the sake of full disclosure, there will be spoilers ahead, but not for everything in the movie. 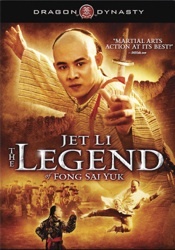 Fong Sai-yuk establishes his folk hero status during the opening sequence involving a track and field competition, where he jumps the entire pit of the long jump from a standing position and running so fast that his braid hilariously streams at full length behind him. Li is taking a step away from his usual stoic hero shell and plays it more hammy and outgoing; he smiles and laughs, playing Sai-yuk as an overgrown kid who’s having fun wherever he goes more than some gunslinger kung-fu master. Sai-yuk has no chip on his shoulder; he loves living his carefree life. Thanks everyone! I love fighting! Like any tall tale, the movie also has ridiculously outsized characters. Sai-yuk is easily cowed by his traditional Asian parents, in broadly comical fashion; his father is martially inept but rules the house with an iron fist, while Sai-yuk’s mother (played by the electric Josephine Siao) is a chattering, scheming tornado of kung-fu bravado, alternating from nagging her son for not doing better and doting on him. Most of the comedy is generated by the mother or her interaction with Sai-yuk, who Li depicts with a wide-eyed boyish charm which starkly contrasts his fighting persona. Finally, there is the main villain of the film, called the Governor, who stops just short of mustache-twirling because of the menace behind lines like “I used to beat my dog like this” before delivering a hellacious whoopin’. The best action set piece (of the six notable ones) happens towards the middle of the film, and illustrates the best elements of the mythic Fong Sai-yuk. The newly installed local magistrate, Tiger Lui, is trying to curry favor from the locals by offering to marry off his lovely daughter to anyone who can defeat his wife in a kung-fu showdown. (It’s a great way to make decisions. Totally foolproof.) CAVEAT: not only do you have to defeat Mrs. Tiger Lui, you have to do it while atop of a Rube Goldberg-ian platform contraption riddled with wooden booby-traps, and NEVER let your feet hit the ground. Sai-yuk can’t resist a chance to prove that the people of his neighborhood are the best, so he takes on the challenge at his friends’ request. The fight hits a new gear when it spills off the wooden contraption and onto the heads of the nearby spectators, still adhering to the rules that neither contestant can hit the ground. Director Corey Yuen’s creativity is on full display here in the mechanics of the contraption and the choreography of the fight inside of the crowd, especially the point of view shots of Mrs. Lui and Sai-yuk kicking each other on top of people’s heads. 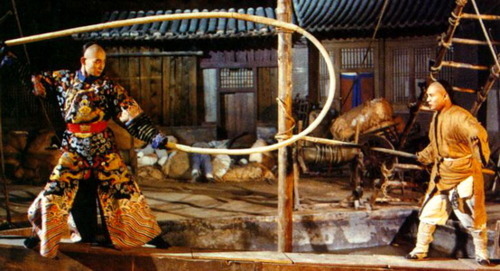 Yuen does not necessarily have an eye for the classical ballet of “serious” action like Yuen Woo-ping, but he is efficient at establishing a magical reality with the wirework, sped-up film, and the predominantly bloodless violence that is appropriate for the tone of a tall tale like this one. Sai-yuk ultimately defeats Mrs. Lui, but disqualifies himself when he realizes there is something suspicious about the contest, involving a bait and switch with the promised daughter. Sai-yuk’s mother, Mrs. Fong, hears of her son’s defeat, and decides that now it’s up to her to protect the reputation of her town and her family. She disguises herself as the older brother of Fong Sai-yuk and challenges Mrs. Tiger Lui, although the disguise amounts to braiding her hair, wearing a hat, and cross dressing. Mrs. Fong defeats the wife, but in a tragic near-accident, Mrs. Tiger Lui almost plunges to her death if not for the intervention of Mrs. Fong, and then things get weird. The music switches to a dreamy harp; the film switches to slow motion. Mrs. Tiger Lui, mouth open, head thrown back, gazes lovingly up at the stoic, stiff-chinned “man” who is rescuing her. Mrs. Fong, in character, holds her (his?) damsel in distress in a pose worthy of any Harlequin romance cover. Don’t worry, we come back to that plot thread before the end. Let me just tell you, it's not easy dressing up to be a man. The cross-dressing in the story might seem too broad or unworthy of suspension of disbelief, but the stretches where the movie embraces this heightened tone is when it’s at its best. The movie cuts right to the light-hearted soul which is at the core of this and every other tall tale. When Sai-yuk fights hundreds of bad guys, there is no special gory attention paid to any of their injuries; it just matters that he beat them (the movie only dwells on gruesome injuries when the Governor administers them). There’s the fact that Mrs. Fong goes to mush whenever Mr. Fong recites cheesy nature poetry, or the piteously ugly servant Macu, and Jet Li’s wide-eyed, bubbly performance. Whenever that life gets a little too serious, the movie suffers, just a little bit. I appreciate that there are serious moments, because a completely lighthearted movie may have gone too far in the direction of campy chop-socky, but the serious parts took me a little out of the movie. There is an emotional scene (look, I think it’s touching) where Sai-yuk takes revenge for the death of a friend, but the emotional energy is so different from anything else in the movie. I speculate this could be from the filmmakers’ decision to ramp up the seriousness for the climactic showdown battle between the Governor and Sai-yuk at the end. The end battle is decent, but since it’s missing the sense of fun and play from the rest of the movie, it feels like any other fight scene from any other movie. What also feels heavy-handed is the hamfisted efforts of the movie to represent the common people as rising up against their oppressive government oppressors, which many experienced kung-fu watchers know is the price you have to pay to get a movie made and past the Chinese government censors. It’s just another part of the movie that gets out (although this time, it’s forced to) of the happy-go-lucky tone of the tall tale. It does make me snicker just a little bit, though, because I am a terrible Communist, to watch a large crowd of Chinese people waving flags, or small children and old women coming to Sai-yuk’s aid to rescue his father from the Governor (oppressor! ), or the need for a grassroots secret society who plot to overthrow the corrupt emperor and his minions. It would fit much better in a more serious movie, but ultimately feels out of place in this one. The movie definitely works as a tall tale; it’s actually at its best when doing so. As for well-told, it does a lot of things right, in terms of a genuinely unique choreography and an engaging lightness, but gets a little bogged down when it’s forced out of that mode, which is unfortunate. I don’t know if I’d want to see a story with Paul Bunyan, John Henry, or Pecos Bill trying to do something with the world at stake, partly because hero stories have gone to that well too often, but because that’s not what they’re about. Heroes of tall tales end up helping people but not because they were out to save anyone; they do so almost out of the accident of their own amazing abilities. Those amazing abilities are what stir up our sense of wonder, and with that wonder, a sense of hope. That sense of hope is why a movie like this one, though far from perfect, sticks so joyfully with me. The Weinstein Company’s Dragon Dynasty division has released this as The Legend of Fong Sai-yuk, on DVD and Blu-ray, with the necessary Cantonese audio track, which are probably the best versions available. I'd like to check this movie out. Speaking of kung fu, I discovered that Amazon is selling two four packs of previously released Shaw Brothers movies at a pretty cheap price. Four movies for $6.99, if you're interested. I can't say no to cheap kung fu. I love cheap kung-fu also, I will definitely check that out. Thanks Heath! I like the new title too Mark! I just lost accidentally lost all of a longer comment relating how much I've come to like Jet Li lately (because of Unleashed and Fearless) and I'm too annoyed to try to recreate it, but great column, I'm interested to see this! Sounds like it may have a similar sort of tone as Fearless but a bit more light-hearted? Also - I'm about to order Fist of Legend and Tai Chi Master (for less than $10 each) - I know you'd recommend the former - how bout the latter? Fist of legend is great, I hope you like it. Oh and Sol, if you have not yet seen Black Mask (1996) that should be towards the top of your Jet Li list. Also of note is Tsui Hark's often imitated magnum opus Once Upon A Time In China (1991). Jet is phenomenal in both films. OUAIC is also just an amazing film and was my gateway into Tsui Hark and Chinese/Hong Kong cinema. Hey Tom, thanks for the suggestions - I'm going to add Black Mask to an Amazon order - I haven't seen it, and it sounds like you know what you're talkin about! Looking at Once Upon a Time in China - appears to be a trilogy - do you recommend the whole thing or just the first? I haven't seen TAI CHI MASTER, unfortunately, so can't speak to that. @Sol - FONG SAI-YUK is definitely much more about jokes than FEARLESS, which is a pretty meditative and serious (though not somber) piece. Sol, I agree with Mark in regard to Once Upon a Time in China. The first is the best, and in my opinion a masterpiece of Tsui Hark and the genre. Parts 2 and 3 suffer from diminishing returns, I like them but they are not as good as the original. If you find you enjoy the first and you enjoy Tsui Hark's style then by all means give them a chance. Oh, and if you are into audio commentaries try to find the copy of OUATIC with the Ric Meyers commentary track. He is an amazing critic and expert on Hong Kong cinema. Listening to his commentary in the film really opened my eyes to what was really going on in the film from its cultural perspectives. As far as Black Mask it is just a balls out action film, bloody, violent, and off-the-wall. I mean, it has a body bomb it it. Plus a good performance by its supporting actor Ching Wan Lau as Det. Rock. He is also great with Andy Lau in Running out of Time (1999) another fantastic Hong Kong film. Thanks again, guys - just put in my Jet Li binge-order now and it didn't kill my wallet. Found a Dragon Dynasty Jet Li triple-feature blu-ray set with The Legend, Fist of Legend and Tai Chi Master for only $17 along with Black Mask and Hero blus for less than $10 each. I'm going to know Kung-fu soon too! OUATIC will have to wait - it's a bit more pricey - though I may check out that YouTube link. What's F This Movie's moral stance on YouTube movies anyway? Nice, looks like you got yourself a good sampling. Everything from ridiculous bloody action (Black Mask) to meditative, auteurism, quasi-art film (Zhang Yimou's Hero). If you dig "Hero" you might want to check out the same director's "House of Flying Daggers". Not quite as arty but with a tighter narrative. No Jet Li in that one, but two of the best leading men in Chinese cinema, Andy Lau and Takeshi Kaneshiro with Zhang Ziyi. There will most likely be a HERO column coming. I love that movie a lot. @Sol - Let us know what you think of those movies once you binge on kung-fu. I will be looking forward to your Hero column; its one of my favorite movies so it will be interesting to see your thoughts on it. One interesting thing I read about the film was that it was Zhang Yimou's answer to "Crouching Tiger Hidden Dragon". He hated Crouching Tiger. Stating that he thought Ang Lee sold out to the western audiences, to their aesthetics etc. So Zhang Yimou was like, "...you want to see WuXia? I will show you true WuXia." 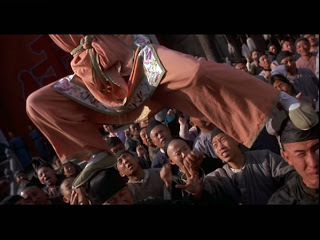 I can understand Zhang Yimou's viewpoint, but Ang Lee had a very different goal for his movie than Zhang had for his. Still, I like that Zhang is a cranky enough guy to make a great movie almost out of spite. Fantastic article Mark, I think you and I are kindred spirits. After getting a few lines into you review I seem to remember knowing of this film but I don't think I have actually seen it. I must have somehow missed seeing it over the years. Heck, I even have his first film "Shaolin Temple" (1982). I will be watching this one tonight. Glad you like it, Tom! It's always great to hear from kung-fu movie fans. There is also a sequel (FONG SAI-YUK 2), which I also like, but would probably put below the first one.